White House Down reveals what a dad will do to protect his daughter. While on a tour of the White House with his young daughter, a Capitol policeman must take action to save his daughter and protect the president. As a dad of two young daughters, I can't help but like the stars in this film. This special screening was Channing Tatum's first public apperance since becoming a new dad (to a daughter). Jamie Foxx is a dad of two daughters. So, of course I was excited to attend the special Mamarazzi® event in Washington, DC for their new film White House Down. Think Bruce Willis and Die Hard! Enough said. Yeah, that whole "White House Down" thing isn't just a cute title. They mean it. Of course the explosions are amazing. That's why the "total destruction" part made number one on my list. However, the film's comedic delivery, for me, helps make the whole idea and storyline even more believable. If this film didn't include the real-life humor—it wouldn't be half as entertaining. 3. It's All About A Dad Trying to Save His Daughter. White House Down shows a strong example of fatherhood in John Cale. Cale will stop at nothing to try and save his daughter—all while saving the President. I enjoyed watching the film and hearing Jamie and Channing talk fatherhood and parenting tips at the special screening was a major bonus. Interested in Channing and Jamie's dad tips? Watch this clip from The Moms and get to the theater June 28! 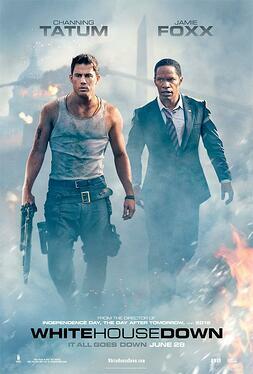 From White House Down: Capitol Policeman John Cale (Channing Tatum) has just been denied his dream job with the Secret Service of protecting President James Sawyer (Jamie Foxx). Not wanting to let down his little girl with the news, he takes her on a tour of the White House, when the complex is overtaken by a heavily armed paramilitary group. Now, with the nation's government falling into chaos and time running out, it's up to Cale to save the president, his daughter, and the country.